We're not sure when the whole wide world of Fashion gets the annual "memo" about what colors will take the runways by storm, but season after season, the big tonal trends do shine through. Like everyone else, we love fall colors best...partly because the shades go deep and dark, or alternately, bold and bright. But this fall introduced a few unexpected contenders in the color category: Along with rich purple, mixed olive tones, and more burnished metallics, soft classic camel made a comeback and so did the brightest red. To get you on the right color wheel, we've rounded up the six fall color trends to start bringing into your own closet...September is, afterall, just one little month away. 1. Camel—If you're not sure if you have any camel in your fall/winter wardrobe, now's the time to stock up. Gucci, Chloé, and Dries all paid homage to fashion's most decadent neutral. 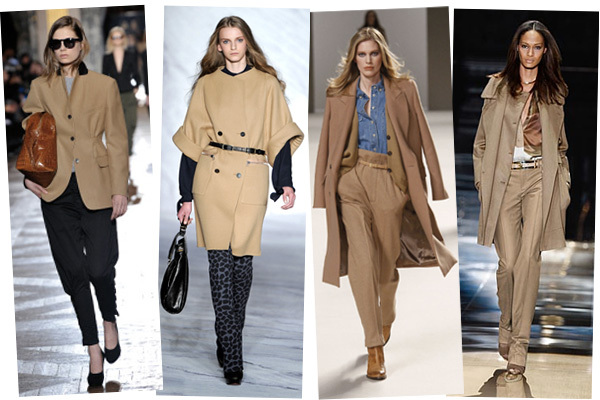 We recommend a camel blazer or overcoat, just like Dries and Michael Kors did. Above, from left: Dries van Noten, 3.1 Phillip Lim, Chloé, and Gucci; all photos courtesy of the designers. 2. 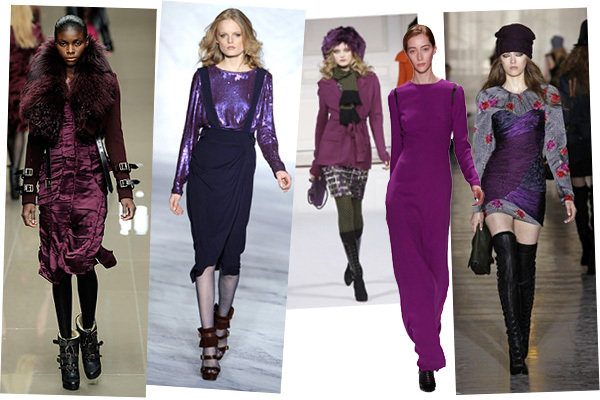 Rich Purple—Gem tones reigned supreme for fall/winter 2010, but the deep purple and plum colors that lit up the fall runways of 3.1 Phillip Lim, Burberry, and Oscar de la Renta dazzled us most. Above, from left: Burberry Prorsum, 3.1 Phillip Lim, Oscar de la Renta; Yigal Azrouël, Jill Stuart; all photos courtesy of the designers. 3. 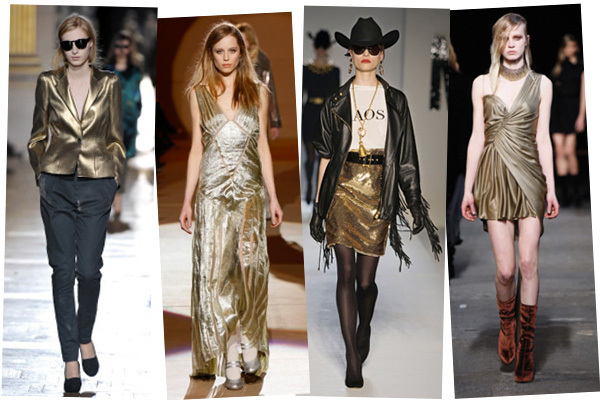 Modern Metallic—When designers remind us they love metallics, let's just say they're preaching to the choir. In little skirts, tailored blazers, and floor-length dresses, silver, gold, and soft copper all returned the runways for fall in a big way, thanks to Marc Jacobs, Alexander Wang, and Moschino. And we love every bit of it. Above, from left: Dries van Noten, Marc Jacobs, Moschino, and Alexander Wang; all photos courtesy of the designers. 4. 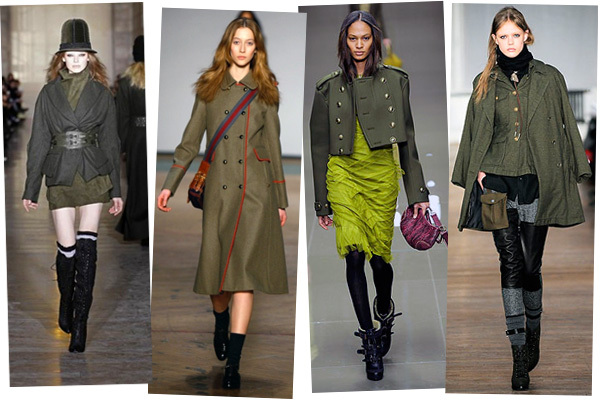 Mixed Olives—Building on the military trend that began a few seasons ago, all shades of olive greens, browns, and fatigues had a surprise impact for the fall season. Burberry Prorsum lead the charge with Jill Stuart and Rag & Bone all turning out their own delicious helpings of mixed olives. Above, from left: Jill Stuart, Marc by Marc Jacobs, Burberry Prorsum, Rag & Bone; all photos courtesy of the designers. 5. Pale Blue—The dark horse of fall 2010's color trends, pale blue really caught our attention not only because it seemed unexpected for the cold season, but because it had an icy-cool modernity that seems incredibly chic right now. Chanel, Tommy Hilfiger, and Marc Jacobs all delivered a cool-blue spell worth catching. Above, from left: Fall 2010 runway looks from Chanel, Tommy Hilfiger, 3.1 Phillip Lim, and Dior; all photos courtesy of the designers. 6. 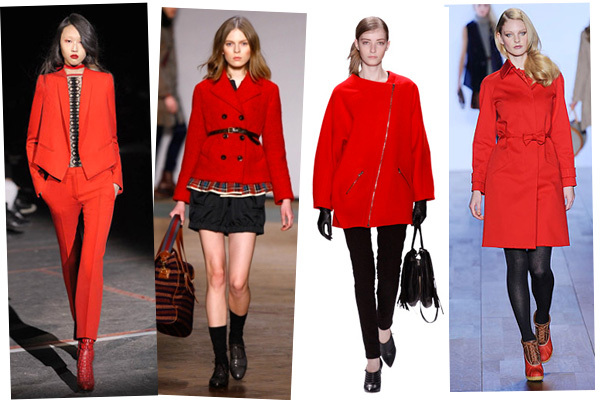 Bright Red—Give us a bright red blazer or day-dress any day! And this fall, designers like Dolce & Gabbana, Jill Stuart, and Yigal Azrouel all revisited this classic red-hot shade in a fresh new way. Above, from left: Fall 2010 runway looks from Givenchy, Marc by Marc Jacobs, Yigal Azrouël, and Tommy Hilfiger; all photos courtesy of the designers.